My daughter started second grade this week and she has spent her summer enjoying Harry Potter. She has read the first two books on her own and just started the third. Of course, for our annual Halloween party what could be a better theme given that the last movie came out this year. In my continuing search for party ideas, these fantastic travel posters came up. 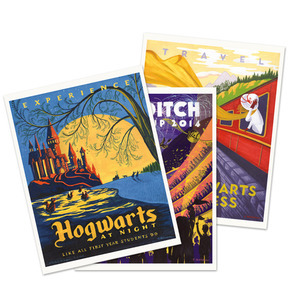 They were created for Muggles who are looking to spend some vacay time in the wizarding world. I love the vintage vibe! See how the artist, Caroline Hadilaksono, came up with these posters here. If you would love to get your own set, she has them for sale too!